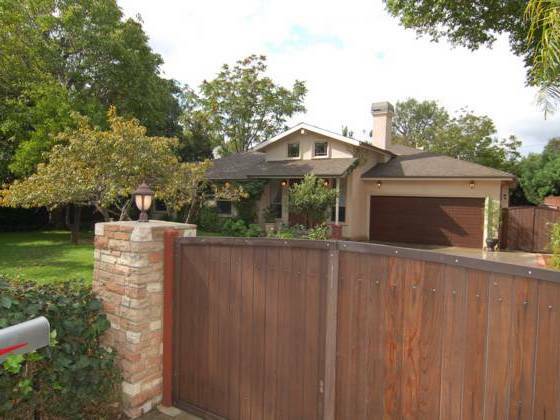 This spectacular gated Hidden Woods, 4BR 3BA, single story, 2004 remodeled home is designer perfect. Dramatic 10 foot entry doors lead to the living room complete with vaulted beamed ceiling, romantic fireplace, clerestory windows and arched doorway to the dining room. The gourmet kitchen boasts granite countertops, Viking and Kitchen Aid appliances, ample cupboard space and is open to the sharp family room adorned with fine furniture style cabinetry. The master wing features a custom walk-in California Closet(shown on TV!!) lavish bath with dual sinks, a spa tub and separate shower, and a sitting area. Sparkling French doors lead to the lush rear yard from the master suite, family room and guest room. Custom paint, hardwood floors, a full laundry room, finished garage, alarm system, and amazing attention to detail throughout make this an exquisite home.